I drove the hour and three-quarters over to High Reach Farm last Wednesday morning, leaving the house a little after 6:00 am. It was a beautiful morning to take a delightful drive, especially knowing that I would be working on the farm the next two days, staying overnight and not returning until the following evening. I was able to relax into the anticipation of spending time with my friend Steve, visiting and exchanging new ideas and developing on old ones whilst spending long days out of doors engaged in the practical and satisfying work of tree farming. In a way, these visits - weekly when I can manage them into my busy schedule - are an escape for me, an escape from the office, from computer and telephone, an escape from the responsibilities of my geomantic practice and the focus and demands of working with clients. It is also an escape from the urbanization that spills southwards towards my office from our nearby city of Burlington, Vermont. Sometimes too my farm trips can offer themselves as an escape from domestic concerns and from the difficulties and struggles that offer themselves in the growthful and challenging arena of marriage. As I headed east down the interstate, the sun rising between Vermont's green mountains, a heavy steamy mist was rising all down the valley from the ponds and rivers winding their way to Lake Champlain, I felt my own spirits lighten and anxieties and emotional burdens lift from me like the water vapor rising up and dispersing into the morning. The road to the farm is almost a mythical journey into a rural innocence, passing gradually into more and more beautiful and sparsely populated landscape, on smaller and smaller roads until the last nine miles from the nearest grocery store become unpaved dirt road through the ubiquitous regenerating forests that cover eighty percent of Vermont's landscape, dotted and interspersed with the dairy farms that keep the remaining twenty percent of the land open and grazed. It strikes me very much on this particular morning that the nearer I get to my destination, the more my body relaxes. No office worries or anxieties of outstanding papers to push around my desk for sure, and of course I am aware of the pleasurable anticipation of seeing my friend, but I also know that we are now late in the season for the harvest of native trees that Steve digs from his woods and sells wholesale to landscape architects up and down the state, and the work is likely to be heavy - some of the trees in their burlap root balls weigh three hundred pounds, and we will be digging and moving these around by hand between the two of us. Heavy, sometimes grueling work that can leave muscles exhausted and aching and bring a person to be happy just to sit motionless for an hour at the end of the day and then take an early night. Even knowing that the work today may be hard and heavy, I feel a peace and serenity move through me as I arrive on the farm. I realize that it is a familiar feeling, and not one that can be put down simply to putting myself beyond the reach of my fax machine. I recognize it clearly as the gradual deep release that comes when I am working with geopathically stressed land or buildings. My work as a jobbing geomancer both in Scotland and New England is a delightfully varied practice working with places very large and very small, domestic and commercial, public and private, pre-design and post-build. I work with labyrinths, healing sanctuaries, shops and schools, estates and gardens, energy mapping and balancing in buildings sick and sound, and in homes both happy and sad. The bulk of my bread-and-butter work is with Geopathic Stress, working with places where the energetic relationship between people and place has become toxic, often with a great deal of associated emotional trauma and dissonance held in the energy field, with or without the presence of disturbed and disoriented spirits. This energetic soup of trauma and dissonance can be very disturbing to attune to, as one must as a dowser and healer of place, and I typically know how bad the problems are by how tightly I feel myself contract and tighten as I arrive on the site. The tension that develops in my body, most noticeable in and around my gut and abdomen, gives me a feel for how the people resident in that building feel most of the time. As my work proceeds on site and the healing process goes along however, - earth acupuncture easing chi flow and restoring vitality, psychic intervention allowing the release and easing of long-stored hurts, the pain, dissonance and trauma are gently brought to a harmony of peace and balance, and a state of grace often descends upon the place. The way I generally notice that my work is taking effect is that my body starts to relax and my mood to lighten. This is for me a most interesting phenomenon, and one that is so repeatable that it has become predictable. I never know which stage in the process of healing is going to bring the energy field into peace and balance, but I know that creeping feeling of ease that accompanies it, almost like the relaxing warmth of easing into a hot bath. The piece here that is of interest however, is that while I am intensely aware of the tension and contraction that occurs when arriving at and entering a disturbed energy field, after quite a short time my attention shifts to interacting with my client and then beginning to assess the nuts and bolts of the situation and commencing on the work of the healing process. I am no longer conscious of the tension as I go about my job, only of the feeling of relaxation as the atmosphere actually lifts. Although no longer conscious of it, my energy field and accompanying emotional availability in that situation are literally "held back". For Steve, his farm is a shamanic landscape. Intimate with each of his eight hundred acres, his farming strategy is to balance the human ecology with a thriving and vital land ecology. Logging is performed in a fashion that improves the habitat for deer and songbirds. His organic, ecological and environmental practices have brought him state-level award and current status as "tree-farmer of the year". Much more profound than these outer practices however, is the intimate relationship that he has cultivated with the spirit of the land through meditation and inner journey, and through mindful presence in every minute of his work. It is this which guides his outer practices, and it is this level of intimacy and consciousness that has led him to engage in a deep healing of the spirit of that land. 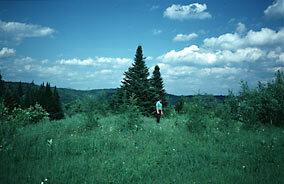 Although I have been visiting his farm for fifteen years and talking healing and geomancy with Steve until long after the cows came home, I had never quite put those two pieces together for myself - the relaxed intimacy that I felt when on that land and the fact that he has given it so much healing attention at the level of pure spirit as well as in outer, material forms. His is a landscape without pain. A landscape without either an underlying note or chord of dissonance buried deeply, or of pockets of trauma and woundedness to stumble into. It is literally safe to allow ones spirit to expand there, knowing that the edge of ones aura will not suddenly encounter psychic razor wire or emotional landmines. How rare this is, and how little we notice - so much of our time we are in landscapes of place and of people that are woven with pain and fear, anxiety and hurt. We may notice the initial contraction, but once pulled in to ourselves, we no longer notice how small we have become - we have simply adapted to our environment, and in our adaptation, defined limits to our energetic and emotional availability - literally limits to our preparedness to be intimate there. When encountering a new environment, our own subtle energies naturally expand outwards - until they meet trauma or pain - and then they contract a little, and stay there. The further out they go before meeting such pain, the more relaxed and alive we feel, and the more intimate we are becoming - the more open we are, literally to the energies of that place and the other people who are present there. The healing of pain and trauma in place literally allows the experience of intimacy and the enchantment that draws us out of ourselves not to end in disappointment and disillusion as we so often experience. For enchantment and intimacy and expansion to go on and on and on, we need to create safe landscapes for ourselves, landscapes without pain and hurt to our subtle senses just as we would create a playground for small children without broken glass to create pain in their bodies. I have realized that anywhere in my life that I feel contraction is calling for my healing attention, calling for me to re-engage with compassion and intimacy. I have arranged therapy for my fax machine. There is research evidence that dowsing zones, an area whose perimeter is defined by dowsable energy, attract heat and can become permanently hotter than their surroundings, only a few inches away. The temperature difference is around 2-4° F. This is significant and the zone can involve a large area of land. It has been used to promote the earlier growth of bulbs and help protect them from the cold. Other potential applications will come to mind and if the temperature results can be more widely substantiated, the effect of the zone would seem to herald a revolutionary discovery that will confound science and attract interest in the subtle energies involved in the dowsing phenomenon . The research information has been extracted from the very informative private publication entitled "Solar Energy and Dowsing" by A.P. Tabraham, Isles of Scilly 1982. Tabraham was an enthusiastic horticultural researcher who was intrigued by the early flowering of the narcissus, Soleil D’Or. He took careful daily measurements of ground temperatures over a three year period. His conclusions are therefore based upon extensive data, not just an isolated occurrence, and this is why I consider his results deserve serious consideration. The impetus for the research work came from the realisation that ground that had been burnt over by a layer of straw around mid-summer’s day each year, remained warmer throughout the whole year. This induced the earlier flowering (approximately 6 weeks) of bulbs, like narcissi. The ground caused a dowsing reaction from L-shaped rods and this observation initiated the search for another means of creating a dowsing zone over the ground without the need for burning straw. Fig 1 shows the max day temperatures (three inches down) for burnt-over ground and ordinary ground for each day of 1979. Fig 2 shows the additional warming more explicitly. The best method established for creating a dowsing zone over a wide area was simply to walk around and mark out a pentagon shape. This did not have to be a regular pentagon, but the important thing was to mark each of the 5 corners and to make certain of exactly re-touching the original starting point. The marking could be done with wooden stakes or just touching the ground with a finger. It was not necessary to have any real physical line marking out the whole pentagon. Reapplying the pentagon increased the effectiveness of the dowsing zone. Over ground, the highest temperatures were obtained by re-applying at 14 day intervals. There was no noticeable improvement after the application of 4-5 pentagons. Extraneous litter and other objects were removed from the dowsing zone for the most favourable results. Application was best performed on bright, sunny days and redone every 6 months. A particularly favourable time was near the longest day of the year ie. late June. Fig 3 shows the max day temperatures ( three inches down) for pentagoned ground and ordinary ground for each day of 1980. Fig 4 shows the additional warming more explicitly. Beware the effect of iron. Do not use iron implements to disturb the soil after bulbs have been planted and the pentagon marked out. Iron seems to absorb and remove the dowsing zone, together with the warming effect. If a field is traversed by a tractor with an iron plough or ridger, then the whole field reverts to normal. Similarly, do not use iron posts or angle iron to mark out the corners of the pentagon as this will be detrimental to the dowsing zone for up to a 6 foot radius. A metal frame placed over a dowsing zone containing freesias, absorbed the dowsing zone both from the ground and the freesias themselves, as demonstrated by their lack of response to dowsing rods. The dowsing effect was subsequently transmitted from the frame by galvanised metal wire to an iron pipe, which now reacted to the dowsing rods. The daily temperatures inside the iron tube were found to be 2-4° F higher than those inside an identical (unconnected) iron tube only a few inches away. Fig 5 shows the max day temperatures inside the two adjacent iron pipes each day of March 1979. Fig 6 shows the additional warming more explicitly. In addition to the increase in temperatures connected with dowsing zones mentioned above, Tabraham observed another example in his kitchen. He noticed that the magnetron inside a microwave oven will give a dowsing reaction, even when it is unplugged. If a heat source (fire, hot ring, kettle etc) is left on, then a dowsing channel will be found to extend from the heat source to the magnetron. A thermometer placed on the microwave will register up to 6° C higher than another one placed nearby. Temperature of jars of water both inside and outside a dowsing zone e.g. a pentagon. Temperature of ground both inside and outside a 6 ft radius from an iron peg or post. Try other electromagnetic waves to see if any interference is minimised by a dowsing zone eg. a pentagon, and the electromagnetic waves are more ‘efficient’. For example, does a pentagon affect radio or TV reception? Try several pentagons. If you do carry out any tests/experiments, I would be extremely grateful if you would let me know your results, either for or against. I feel that the research, if confirmed, is extremely valuable in demonstrating subtle energy effects that can be measured by scientists. It could have a profound effect upon their attitude towards unexplained phenomena like dowsing and give Mr A.P. Tabraham, the original researcher, the credit he deserves for an amazing discovery. A dowsing colleague of mine in Dorset has written to confirm that three pentagon circuits around his house raised the temperature about 2° F. A friend of his treated part of her lawn and one frosty morning no frost appeared inside the treated area, although the outside was white with frost. A final comment. I believe it is important in this work to have the intent that the pentagon dowsing zone should get hotter. Please try it yourself.